Josie Josie Maran Argan Pure Complexion 5 Piece Collection is QVC’s Today’s Special Value For January 5, 2015! 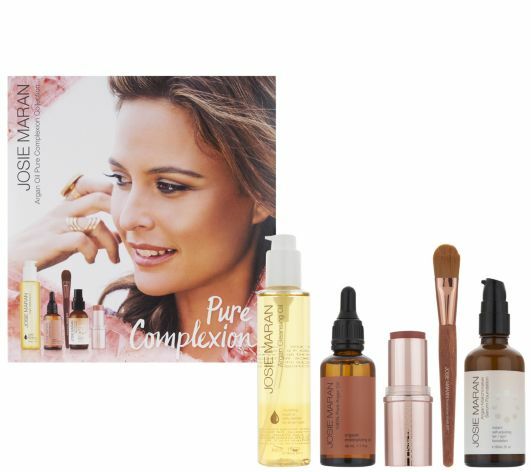 Introducing Josie Maran Argan Pure Complexion 5 Piece Collection exclusively available on QVC’s Today’s Special Value on Monday January 5, 2015 ($69.96 a $213 value)! This collection of skincare and face beautifiers infused with argan oil will help you achieve healthy, glowing skin this New Year! Argan Cleansing Oil removes dirt, while the 100% Pure Argan Oil hydrates your skin. The Argan Matchmaker Serum Foundation and Brush provides even-toned skin care benefits and finally the Argan Color Stick adds a pop of rosy pink to your lips and cheeks! To use, apply Argan Cleansing Oil evenly over dry face. Then, wet the face and massage into a rich milk. Rinse thoroughly. Massage argan oil into skin, hair, and/or nails to help moisturize face, treat split ends, and/or condition cuticles. Shake Argan Matchmaker Foundation Serum well and then use the foundation brush to apply to the face. Sweep Argan Color Stick over the apples of the cheeks and blend toward the temples. Apply to lips for a soft flush of hydrating color. To purchase, watch QVC today or visit http://www.qvc.com. Hurry and grab it while is in on sale today!